This document will guide you through using Koding integration on GitLab in detail. For configuring and installing please follow the administrator guide. You can use Koding integration to run and develop your projects on GitLab. This will allow you and the users to test your project without leaving the browser. 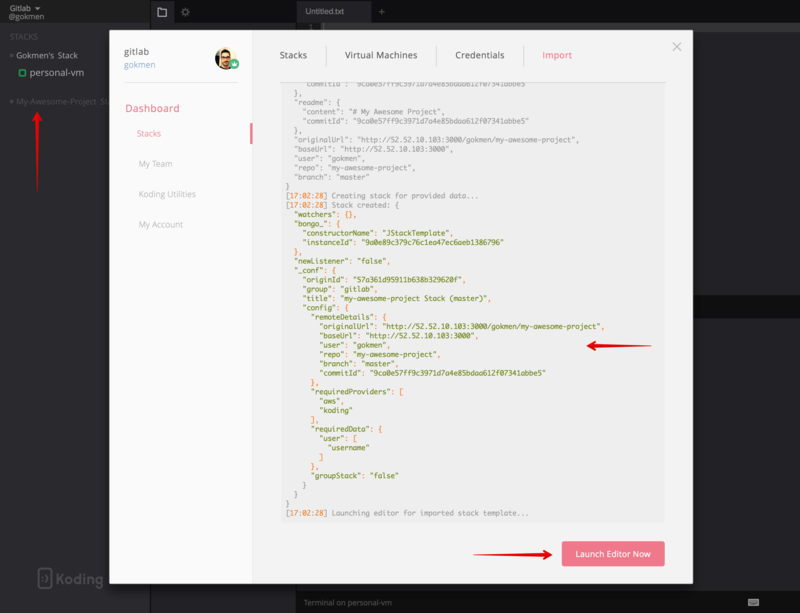 Koding handles projects as stacks which are basic recipes to define your environment for your project. 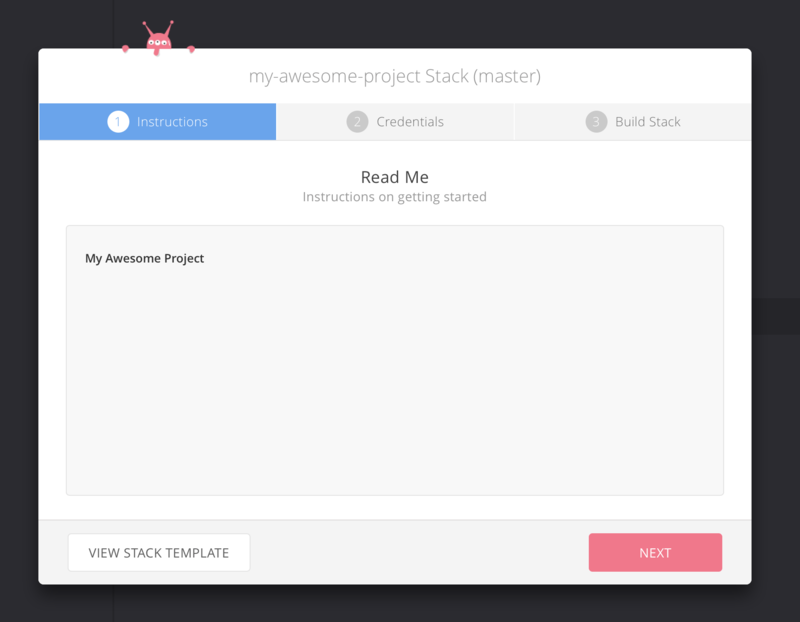 With this integration you can automatically create a proper stack template for your projects. Currently auto-generated stack templates are designed to work with AWS which requires a valid AWS credential to be able to use these stacks. You can find more information about stacks and the other providers that you can use on Koding following the Koding documentation. You can enable Koding integration by providing the running Koding instance URL in Application Settings under Admin area > Settings (/admin/application_settings). Once enabled you will see Koding link on your sidebar which leads you to Koding Landing page. You can navigate to running Koding instance from here. For more information and details about configuring the integration, please follow the administrator guide. Once you click this will open a New File page on GitLab with auto-generated .koding.yml content based on your server and repository configuration. 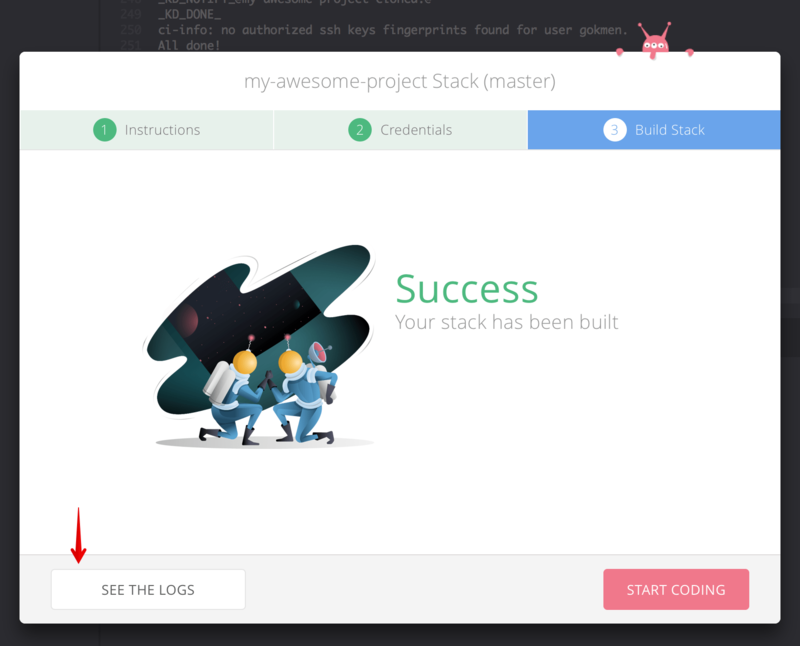 If there is .koding.yml exists in your project root, you will see Run in IDE (Koding) button in your project landing page. You can initiate the process from here. This will open Koding defined in the settings in a new window and will start importing the project's stack file. You should see the details of your repository imported into your Koding instance. 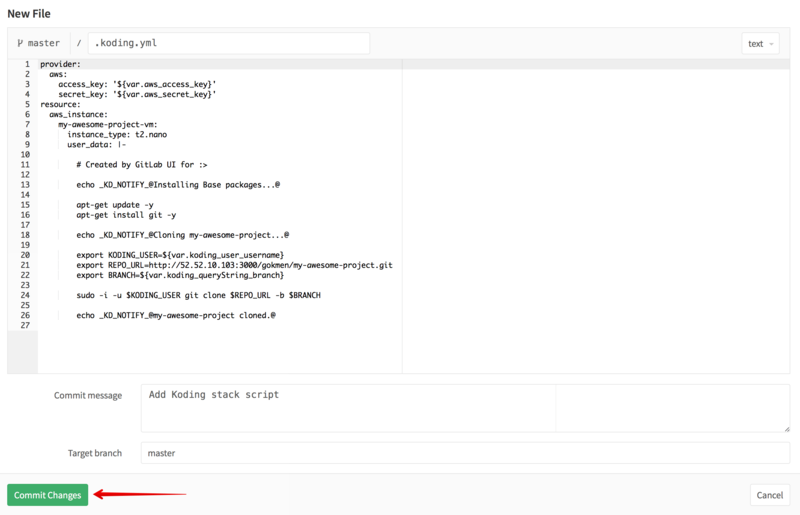 Once it's completed it will lead you to the Stack Editor and from there you can start using your new stack integrated with your project on your GitLab instance. For details about what's next you can follow this guide from step 8. 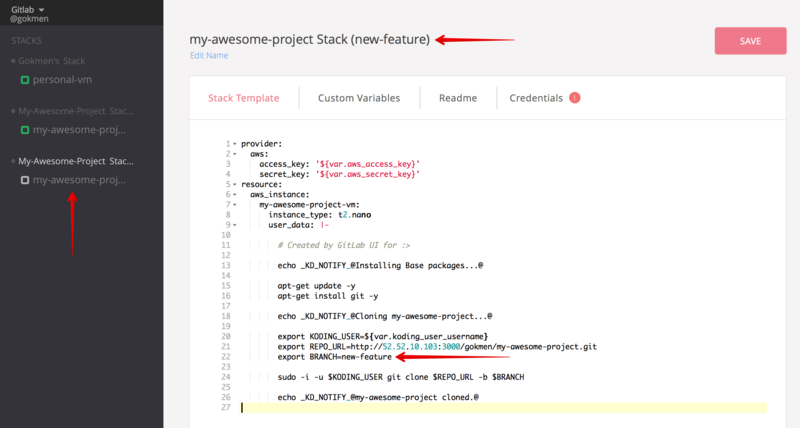 Once stack initialized you will see the README.md content from your project in Stack Build wizard, this wizard will let you build the stack and import your project into it. 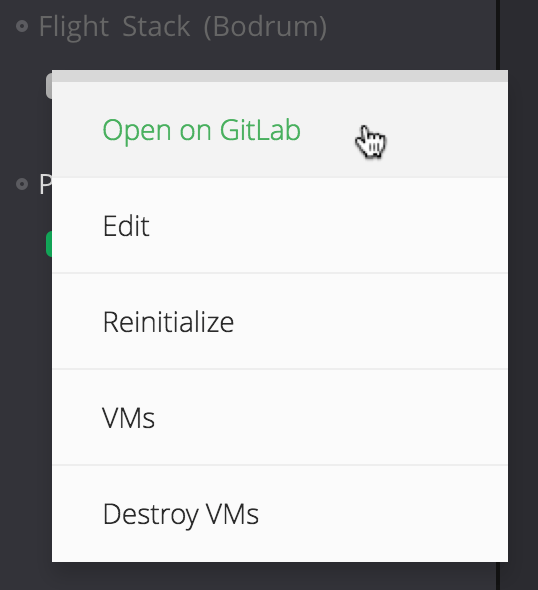 Once it's completed it will automatically open the related vm instead of importing from scratch. This will take time depending on the required environment. It usually takes ~4 min. 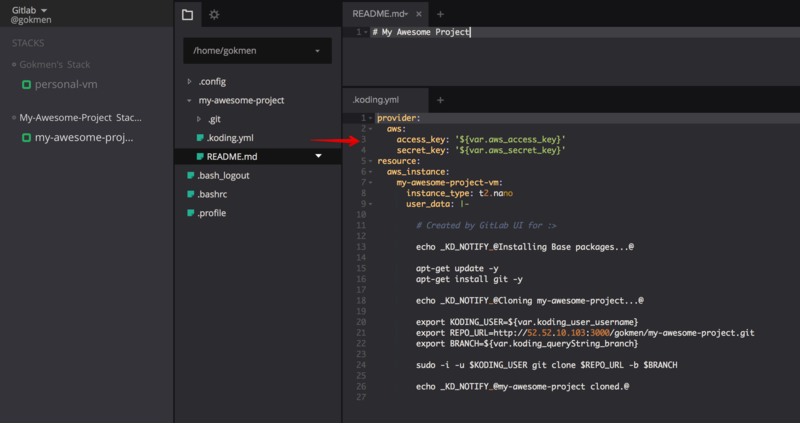 to make it ready with a t2.nano instance on given AWS region. (t2.nano is default vm type on auto-generated stack template which can be manually changed). You can check out the Build Logs from this success modal as well. 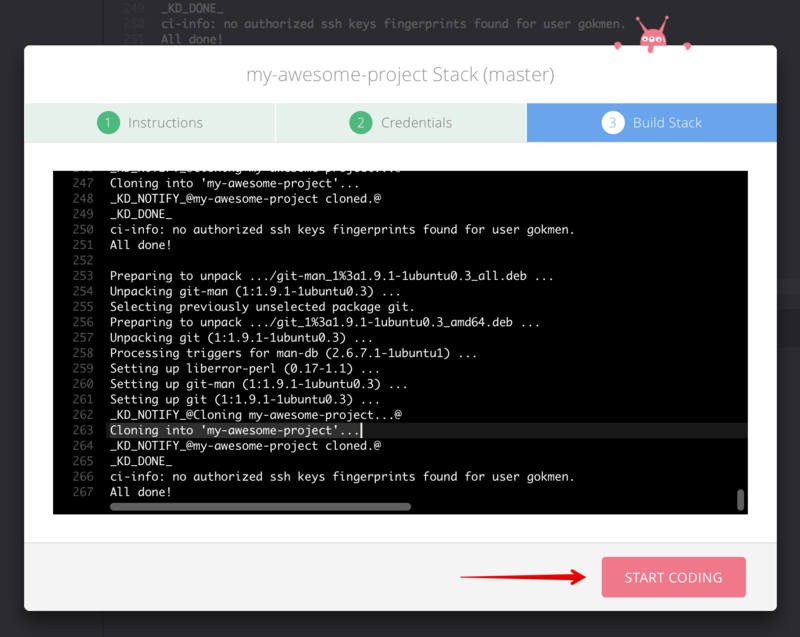 You can now Start Coding! The flow for the branch stack is also same with the regular project flow. Since stacks generated with import flow defined in previous steps, they have information about the repository they are belonging to. By using this information you can access to related GitLab page from stacks on your sidebar on Koding.